International contest "Best products and services of Eurasia - Gemma" determined the winners of the next qualifying stage. According to results of 2012, 710 enterprises won, including 150 from 45 countries of the world, and 560 from forty regions of Russian Federation. Among them are ten firms from Republic Tyva; makers of food products, commercial production and representatives of services. They all were awarded medals and certificates of qualifying tour "Best products and services of Siberia - Gemma-2012". For "Bai-Khaak Akva" - bottled natural non-carbonated drinking water with content of silver - the award went to OOO "Bai-Khaak". 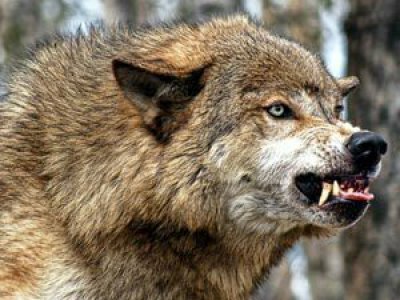 According to expert evaluation, at the beginning of the current year the total number of the grey predators in the republic consisted of more than 2400 individuals. The losses caused by their raids on farming establishments, private households of citizens and hunting industry, is evaluated at the end of the year to the sum of 9.3 million rubles. The most affected districts were Bai-Taiga and Barun-Khemchik, which together account for more than half of the losses caused by wolf raids. In order to regulate the wolf population numbers, a Government decree stated a plan for wolf hunting for 2011-2013, and monetary reward of seven thousand rubles for each killed animal was established. 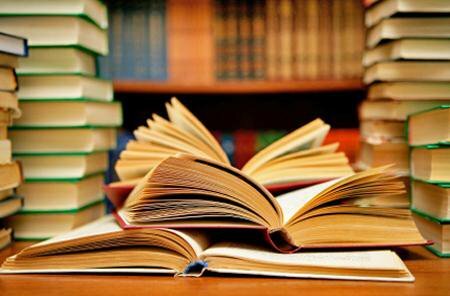 Ministry of education of Russia confirmed a reading list "100 books" in history, culture and literature of the nations of Russia for schoolchildren. Together with organs of state administration, scholarly and pedagogic agencies as well as interested public organizations at first prepared a long list of proposed books. The general long list consisted of about 5000 books. Resulting list of "100 books" was selected out of these, which can be used for organization of independent and elective reading for schoolchildren. 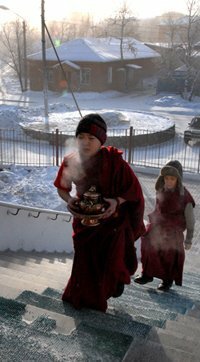 On 11 February between 4 and 6 AM, Shagaa, the Lunar New Year, will come to Tuva. 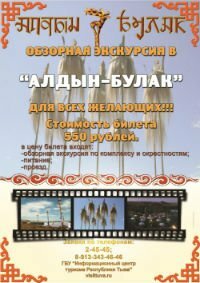 On the proposal of Buddhists of Tuva, the Supreme Khural of the republic unanimously declared this day to be a holiday. 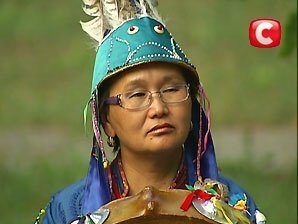 A day off for welcoming the Buddhist new Year is stipulated in the Constitution of Tuva as a day off. 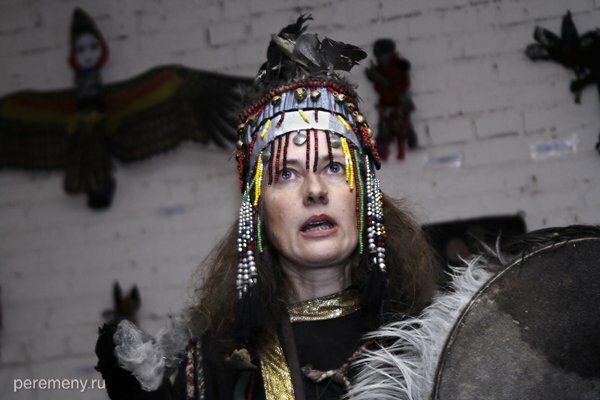 However, this is a floating date, and every year the Buddhist organization of Tuva has to go to the parliament for approval of the date as calculated. 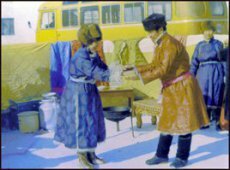 Shagaa, the Lunar New Year will be welcomed in Tuva with the first rays of the sum on 11 February. 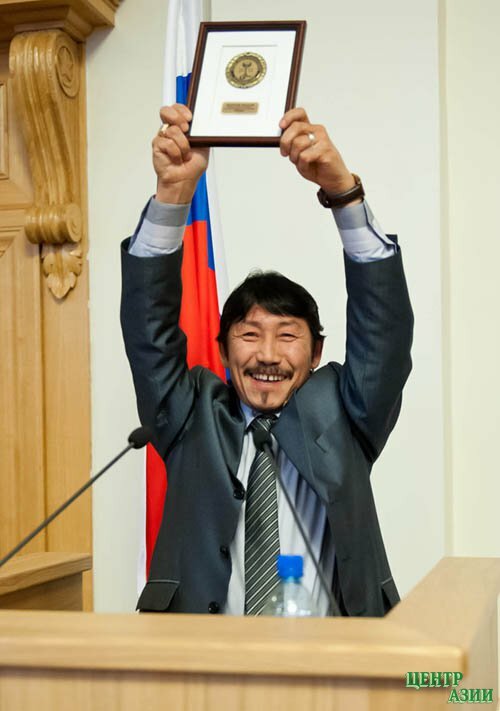 The Administration of the Kamby-Lama of Tuva presented the proposal that 11 February should be declared a holiday to the Supreme Khural. 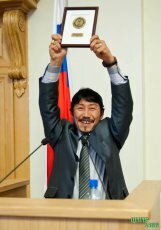 The first regular session of the Supreme Khural (parliament) of Republic Tyva will approve the Supreme Khural Decree "Concerning the day of Shagaa observation in 2013". What is the secret hiding in the eyes of this rider, half-turned to face the visitors? 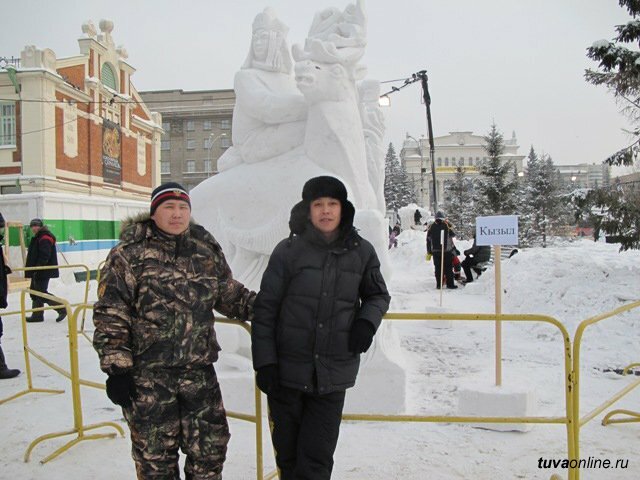 The people of Novosibirsk visiting the opening of the Eighth International Siberian Festival of Snow Sculpture have quite a few questions. What is the animal at the bottom of this composition, why is the taiga woman sitting on a reindeer? 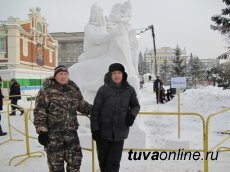 Kreshchenie bathing in Kyzyl began on the night of 19 January on the river Yenisei in the area of Vavilin bay. As midnight approached, a whole chain of vehicles slowly moved towards the place. 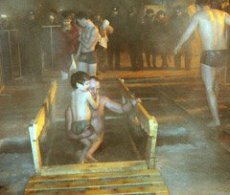 People drove up to the warming tents, where they took their clothes off and bravely ran to the baths, where they took a triple dip. A huge Orthodox cross made from ice stood in front. For safety reasons, the police, MChS and health workers were on duty, but nobody needed help.